Each WhenToHelp user can change their own Username and Password. Coordinators can change their username and password from the SETTINGS page. The Main Coordinator also can change any other coordinator or helper username and password. 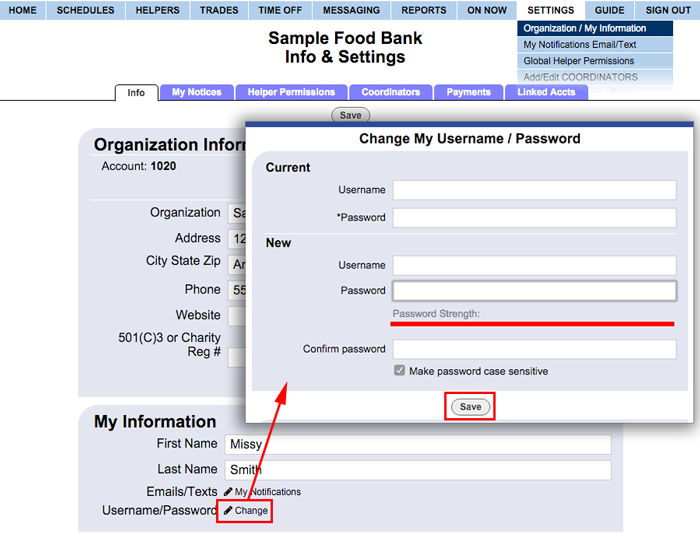 Additional coordinators can change their own coordinator (and helper) username and password. (If their coordinator permissions allow them to edit helpers, they also can change other helper username and passwords when signed in as coordinator). NOTE that resetting the password will expire all previous saved sessions (like bookmarked pages and mobile app icons).